People who don’t have the expertise to operate a vehicle but like to call the shots in the car are referred to as back seat drivers. Then there are the individuals who don’t have a passport but read about international destinations, and we call them armchair travelers. And there is a new group of people who watch an endless selection of real estate shows on television and feel they are inches away from possessing a realtor’s license – I call them House Hunters couch potatoes. I think I’m one of them. I love HGTV – Home and Garden Television. It’s a cornucopia of television shows about real estate, renovation and gardening. Couch potatoes, who may be flipping through the channels on TV, consider themselves experts on bathroom plumbing and deck building. From the comfort of the living room people mull over the choice of a property by the beach or something more convenient in town. I don’t watch all the shows on HGTV. My personal favourites are anything and everything to do with real estate. Maybe I should have been a real estate agent. Though as I think about that, I really just enjoy looking at houses for sale. I’m not too interested in the long negotiation process or contracts and legal considerations that go with the process. Which is why I love House Hunters and the many spin-offs of this very addictive show. House Hunters basic premise is that a person or couple or family is looking for a place to live, and through the 30-minute show the person (or people) is presented with three properties to visit and consider. By the end of each episode a property is chosen and the person (or people) move in. 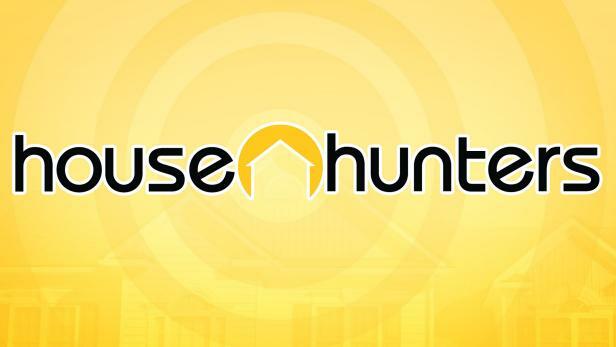 During each episode, the viewers learn about the house hunters – their names, ages, where they live, what they do for a living and their hobbies too. In a few short minutes this show manages to convey a person’s a whole life story! And then we get to the good stuff – we go inside houses and apartments with these people. While I love House Hunters (and others like it such as Caribbean Life or Property Virgins), it is quite shallow and simple. For example, whenever a couple sets out on their house hunt, they usually strongly differ about where to live – in the suburbs or the city – or what kind of house to buy: she wants a two-storey colonial while he is adamant that they must live in a ranch. She won’t even consider a house that doesn’t have a fireplace. He must have a man-cave in the basement. Few people are actually that demanding or narrow-minded when searching for a property, or at least not publicly. The show is a bit of a scripted act. The husband who said a house in the suburbs was a deal-breaker is all smiles when he tells his loving wife that he adored the sprawling home on the cul-de sac as soon as he saw it. Really? And did the real estate agent only show the couple three homes? I highly doubt it. Then there’s the various spinoffs of this addictive show. There’s House Hunters International, Off the Grid, Renovation, Island Hunters Tiny House and now Family too. I think there’s even more that I don’t know about. House Hunters International has inspired me to be not only a couch potato but an armchair traveler too. 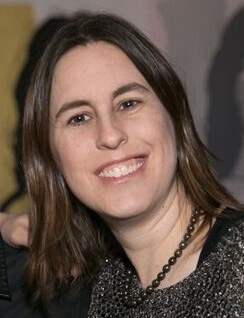 It makes me think that I too can move my family to a beach town in Australia, find the perfect home and settle in comfortably to a new community. Oh, and of course I only have to view three homes to easily make my decision. I’m actually amazed how clueless the house hunters are on the International edition. If you are moving to a new, often far-off country, wouldn’t you do a bit more research on the place, the culture and local real estate trends and prices before you arrive? My criticisms aside, I am obsessed with House Hunters, especially the International edition. Do you ever walk down the street in your local neighbourhood or wander around a foreign city and say to yourself, I wonder what these homes look like inside? House Hunters lets you do that. No matter what home is chosen, we, as viewers, went along for the ride with them and vicariously had the opportunity to see inside the houses and apartments and make our own virtual decisions. And now I need to feed my addiction. Off to my couch for some House Hunters. In a previous post, I stated that I don’t exactly have a green thumb. I am not a natural when it comes to the garden or plants. I admit that I kind of forget to water my indoor plants. But I love the idea of an outdoor garden. I love to walk through my neighbourhood and admire colourful and neat and tidy gardens that have grown to maturity because of a lot of love and care. In our first home, I was determined to create a small garden of my own. I wanted a mix of gentle greenery, hits of colourful flowers, some herbs to give a nice aroma and even a few vegetables in pots. The garden grew and flourished. The vegetables either wilted and died or were pulled and eaten by the many animals that lived in the neighbourhood. Our old neighbourhood was frequented by many squirrels, racoons and even skunks, and they were in charge of the garbage and gardens with food. 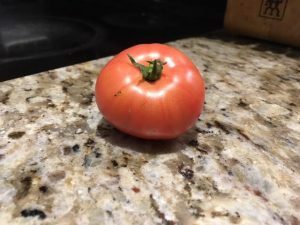 I had little success even growing a simple healthy tomato. When we moved to our current home a few years ago I decided to try again. I thought, maybe the local raccoon and squirrel militia was kept in check a bit better in this area, where most of the garbage cans were kept in garages and sheds. 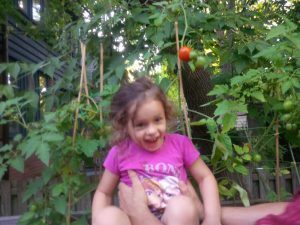 The garden got a late start as we only moved in June and planted a limited vegetable garden. 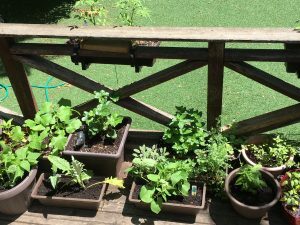 I also planted my vegetables on my deck, right beside my house. The tomatoes came in late, around late August, but they grew! 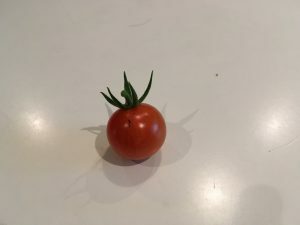 We had a limited tasty crop, and their bright red colour made my garden shine. Did we have a weaker animal population? Did the proximity to the house, on my deck, make a difference? Maybe. 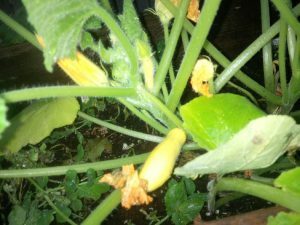 I dabbled in vegetable seedlings in 2015 and 2016 and failed miserably. They all sprouted quickly and easily and grew. I kept them in a warm and sunny spot in my house all spring and lovingly cared for them. I transferred them outside as the weather warmed, and boom, they either flopped and died or the local animal militia gobbled them up. 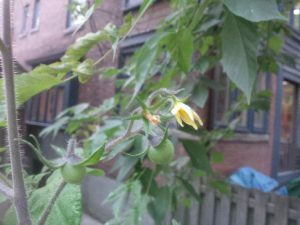 But, I also bought a number of small plants from my favourite Collingwood Farmers’ Market and a bunch more from an organic market north of Toronto called Awesome Blossom. Success! 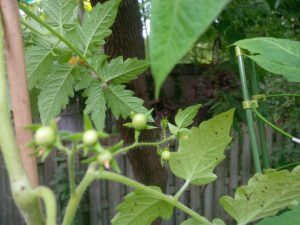 Okay, not big success, but my plants flowered in early summer, and we had a small crop of tomatoes, green beans, peppers, zucchini, kale and lettuce. My vegetables were tiny but cute and I decided that I would push forward in 2017 and build a fresh vegetable garden. I’m at it again this year, and while it’s early, so far things are going well. My giant deck planter had a small incident over the winter (okay, it broke and crashed to the ground), so now each vegetable has its own planter. I think that actually may help so I don’t have any crowding or competition for soil and water. I did experiment with a bit of corn, which was grabbed by the animal militia, but my cucumbers, tomatoes, peas, beans, peppers and a few other goodies are thriving so far. My husband’s experiment with a strawberry, blueberry and raspberry plant have been a bit of a failure. They are growing and are green, but so far all we have seen are two tiny strawberries. We are not ready to grow fruit yet! I am excited to watch my vegetable garden grow and bloom. I will provide updates here as it develops over the summer and we harvest the goodness. Could I Create Victoria’s Garden? Victoria Day and the long weekend that goes with it is marked annually as Canada’s unofficial launch of the summer season. This holiday goes all the way back to 1845, when Queen Victoria actually sat on the British throne and celebrated her birthday on May 24, and Canadians have embraced it for over 150 years. Canadians celebrate this long weekend in various ways: they open the summer cottage, enjoy fireworks, catch up on some overdue spring cleaning and spruce up the garden and lawn. I love to garden, or to put it another way, I love the idea of gardening. 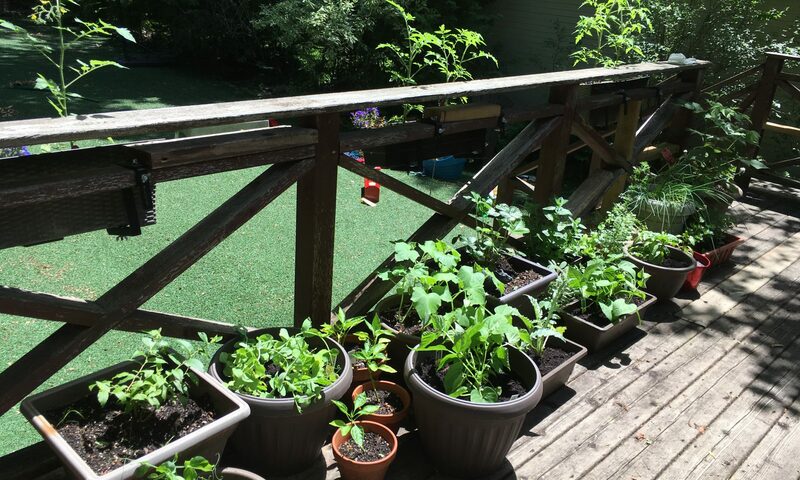 I do not naturally have a green thumb, and I worked hard to create a simple garden with greenery, a nice lawn and a punch of colour in our first home, one we lived in and enjoyed for almost 12 years. We have lived in our current home for three years and it’s been a struggle to create a functioning front lawn. We are lucky to have a large, spacious, flat lot in the heart of the city, but with that comes tremendous maintenance. Our biggest challenge is the front lawn, the first impression zone of any property. When we moved in in June 2014 the front yard was in bad shape. We inherited a balding lawn covered in weeds sitting in front of an overgrown garden with half dead bushes. Over the last couple of years I have cleaned up the garden beds, removed years of dead leaves and brought the small bushes back to life. However, I didn’t do much with the grass patch, thinking always that maybe some miracle would happen and that each spring a thick healthy patch of grass would grow. Boy was I wrong. Last year weeds and clover took over, and this spring an army of grubs moved in. An alert went out to the neighbourhood raccoons who heard there was a buffet of grubs at our house, and they attacked what was left of our front lawn. Neighbours and dog walkers would shake their heads and remark how pathetic our small front lawn looked. I had to do something. After calling a few lawn and garden businesses I chose one that had a great name (Gardenzilla), they were friendly, had good reviews and quoted a fair price to aerate the soil, get rid of the grubs and put nemotodes in to keep the raccoons away and put down fresh grass seed. I dream of a soft, thick green front lawn, and I will keep seeding, treating and watering the grass until one day that miracle will happen. 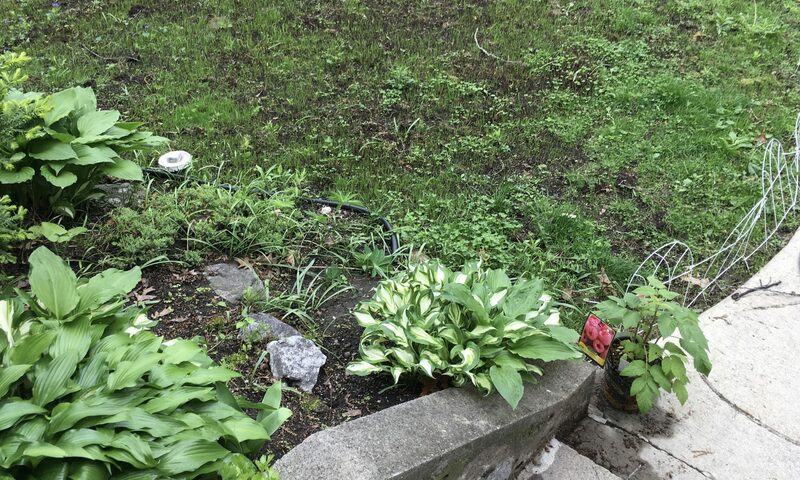 If you have any ideas or simple suggestions about how to help my lawn go green post a comment here or Tweet me @AliciaRichler.